Arsenal director Stan Kroenke has moved to the brink of the threshold where he would have to make an offer for the entire stockholding of the club. The US billionaire has bought another 200 shares in Arsenal's holding company, at £8,500 each, taking his shareholding to 29.9%. 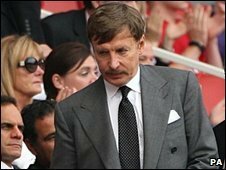 Mr Kroenke bought 100 of the shares from Arsenal chairman Peter Hill-Wood. He is nearing the 29.99% threshold, beyond which he would be forced to make an offer for the remaining shares. The Denver-based businessman's latest acquisition cost him £1.7m ($2.8m). What next for Kroenke at Arsenal? Mr Kroenke, who owns the NBA's Denver Nuggets and Colorado Rapids MLS football team, has been gradually increasing his stake in Arsenal this year through a number of share deals. As well as Mr Kroenke, the other major shareholders are Uzbeki tycoon Alisher Usmanov, who holds a stake of about 25%, Danny Fiszman, and Lady Bracewell-Smith. Following his sale of 100 shares to Mr Kroenke, Mr Hill-Wood now holds 400 shares, representing 0.6% of the issued shares in the club. According to the Arsenal Supporters' Trust, roughly 13% of the club's shares are held by small shareholders. Earlier this week the fans' group said it believed in "plurality of ownership" at the club.